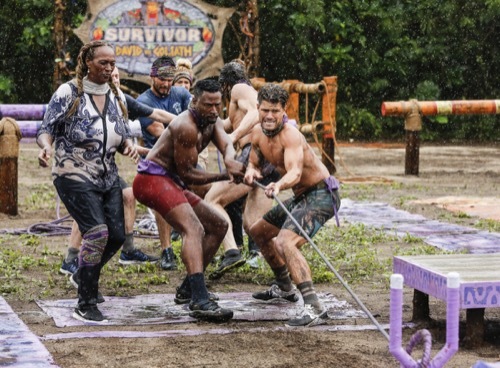 There was some tension back at camp with the Mason-Dixon Alliance on tonight’s all-new episode of “Survivor”. Jessica’s elimination had come as a shock for everyone. Carl misses her the most because she had been like a daughter to him and, with her gone, he misses home more than ever. It took Carl some time to grieve and afterward he found a new resolve. He had reached to some of the others that had been blindsided at elimination and he was secretly forming an alliance against Gabby. Gabby was the one that was blamed for Team Mason-Dixon. The true masterminds were Nick and Christian and they were telling everyone that they hadn’t wanted to eliminate Jess, but that Gabby had pushed for it. She was being painted as the villain so that the guys could go about staying in the middle. The middle ground was their end goal. The guys thought if they stayed there long enough that people wouldn’t scheme against them and so they really went in on Gabby. Poor Gabby thought the guys were good friends and she placed all her trust in Christian. Christian had her believing that it was the nerds vs the world and that she could win this game as long as she had Christian on his team. He meanwhile was going behind her back to strategize with Nick. Nick had seen how close Christian had gotten with Gabby and so he had an additional reason for placing blame on Gabby. Nick believed that with her gone that he would have Christian’s total trust and that’s why he was telling everyone that Gabby has got to go. The David tribe were pretty much all against Gabby because they thought she was this great villain of their story, though while they were getting played, the Goliath tribe hadn’t needed to scheme. They all wanted Natalie gone. She was bossy and not that behind-the-scenes- bossy. She was in your face direct and she made demands of people like they were servants. There was no asking or please or even a thank you with Natalie and that had turned everyone off. They were doing their best to have fun and were playing around for most of the day. They had gotten crabs and had raced them. They also began to bond as a team. So, of course, there was this one person that wanted to disrupt everything and funnily enough it wasn’t Natalie. It was actually Jeremy. Jeremy saw a lot of people going off together and he thought they were having side conversations about who should be eliminated. He eventually went to the others and said that these conversations needed to be stopped. Jeremy told everyone that they shouldn’t be scheming because they should remain focused on eliminating Natalie and all that did was turn people against him. They weren’t having these side conversations liked he accused. They were just talking and enjoying themselves with no doubt to bigger game at play. It was Jeremy that brought scheming into things and that made people think about his motivations. They questioned why he wanted Natalie gone and assumed it was because he wanted to safeguard his own position. The others began talking and they said that Jeremy could be a threat in the long-run. They talked about it and some of them believed that maybe they should get rid of the bigger threat before they take care of Natalie. There were also another group that said they didn’t need to talk about elimination because they never lost a challenge and so that was the group that ended up disappointed. Both tribes went into their next challenge hoping to do their best and it all came down to a Pyramid puzzle. The pieces to the puzzle were hard to get and even harder to assemble. The person that was chosen to put the pyramid together had to be good at what they did and so the Goliath tribe decided to put their faith in Natalie. And some believe that Natalie sunk them. Team Goliath lost their first challenge tonight! Natalia thought Natalie had been useless at the puzzle and the fact that they lost their first challenge made her one to eliminate Natalie even more. She wanted to get rid of Natalie and she wasn’t the only one. Natalia found other like-minded people and so that lured her into a false sense of security. She hadn’t known that there was this second group intent on getting of Jeremy. Jeremy knew that this was happening and so he went around to people talking himself up. He was someone they could work with and he had never gotten into an argument with anyone. Jeremy also said that Natalie had been a problem from the very first day and that he tried to talk to her. He told her how she came across to people and that she needed to fix it. Natalie then took the advice and she went around talking to people. She told them that Jeremy was a snake and how he couldn’t be trusted. And while she hadn’t been as convincing as she liked, Natalie didn’t have to worry about a group of people that had already turned against Jeremy. Jeremy was too charismatic and he noticed too much. He was an actual threat in this game and so the majority voted to eliminate him tonight during their first tribal council. Jeremy was blindsided when his tribe got rid of him and his elimination now means that no one is safe!